Be the first to share your favorite memory, photo or story of Cleopha. This memorial page is dedicated for family, friends and future generations to celebrate the life of their loved one. Cleopha Faulks, 91, of East Orange, New Jersey passed away April 3rd, 2019 with her family at her bedside. Cleopha was born to the late Isaiah and Lizza Faulks on October 1st, 1927 in Nansemond County, VA. She is survived by: five children, Glenn E. Faulks and wife Nazarene of North Carolina, Nathan N. Faulks of Roselle, New Jersey, Joyce D. Faulks and Madie Lou of Portsmouth, Virginia, Thural R. Faulks and wife Lisa or Carteret, New Jersey and Donell Faulks of East Orange, New Jersey. 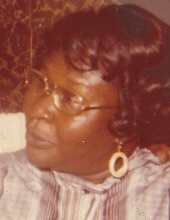 Cleopha was predeceased by two sons, Odell and Willie Lee Faulks, who greeted Cleopha at the gates of Heaven on Wednesday, April 3rd, 2019. Cleopha leaves behind 19 grandchildren, 23 great grandchildren and a host of nieces and nephews to cherish fond memories. Cleopha was an accomplished cook, card player, BINGO lover, and a casino queen. Cleopha lived a very fulfilled life and enjoyed every moment. This Online Memorial has been created to commemorate the life of Cleopha Faulks. Leave a message on the Tribute Wall to share your favorite memories and offer words of sympathy and comfort. To send flowers or a remembrance gift to the family of Cleopha Faulks, please visit our Tribute Store. "Email Address" would like to share the life celebration of Cleopha Faulks. Click on the "link" to go to share a favorite memory or leave a condolence message for the family.